hereYoga Liability Insurance – Why you might not need it. hereA Little Attitude Adjustment … can go a long way. hereNo Pain No Gain … A Yogic Dictum? hereResistance to Change: … Has America really made any progress? hereMac vs PC – which one do yogis prefer? hereThe Yoga Class: Is it Good For Yoga? hereYoga as Therapy … or Yogopathy? hereYour Emotional Stress Test – Are you spiritually insolvent? hereYoga Cred: Have you got it? 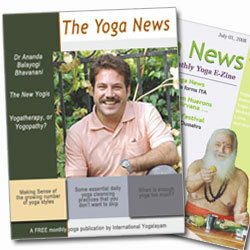 hereNice Yoga Magazine, … but what’s that article got to do with yoga? hereCheap Yoga: Is That What Donation Yoga is? hereYoga Props: A help, or a hindrance? hereWhat is Change? – Do Americans really know what it means? hereAre Yogis Communists? Are there similarities between yoga and communism? hereYoga and Hinduism: One and the same? hereYoga: Is it the new aerobics? hereOlympic Yoga Competition – Is it too big a stretch?